Successive cultures have lived and left their mark on Western New York. The first to have inhabited the region after the glacial retreat, was believed to be the Clovis people (10,000 B.C.) followed by the Lamokas (3500-2500 B.C. ), who hunted and foraged through the countryside. 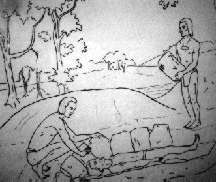 The Lamokas were succeeded by the Hopewell Indians, mound builders who flourished in the region around 300 AD. They excelled in copper work and stone carvings, grew and smoked tobacco, and were probably the first large-scale farmers in the region, cultivating large corn fields in the rich Genesee River floodplain. Over the next 1,000 years, the area became more densely settled by Iroquoian people, living on a great abundance of fish, game and cultivated food. Some say that around the 16th century, the Iroquois population in some areas was greater than the region's population today. Most natives lived south of present day Routes 5&20, offering families protection away from the warpaths along the Great Lakes. As the native population grew, squabbles drove a division into separate tribes. Western New York became the domain of the Seneca. Fighting continued until Deganawidah, a Mohawk, and Hiawatha, an Onondaga, joined the Peace Mother, a wise woman named Jikohnsaseh of the Neutral tribe near Lake Erie, in establishing the Great Law of Peace. This law insisted upon unanimous agreement within the Council of Chiefs before propositions were carried out. It also gave significant power to clan mothers, who selected the chiefs, and established the longhouse as a symbol of universal peace and harmony under one roof. Five tribes accepted the trio's proposal and formed the Iroquois Confederacy with the Seneca tribe as "Keeper of the Western Door."